Have you ever noticed how many pro-government Trending Topics are all over the Venezuelan Twittersphere? Ever wonder how the central government really does that? 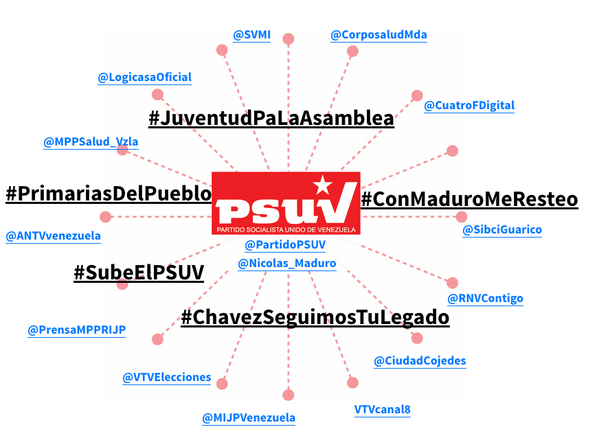 The folks at NGO IPYS Venezuela recently released two reports that spell out how the hegemony uses the zillions of Twitter accounts belonging to State officials and institutions to both spread its propaganda and attack opponents. The first one, titled “Army Caliber 2.0” (El ejército calibre 2.0) analyzed how the hegemony promoted five Twitter hashtags last May, by using at least 65 accounts of State entities, including Ministries, companies and of course, media outlets. These hashtag pushes were coordinated (Tuitazos) and the government boasts of them as a revolutionary success. The second report called “Official Offenses in 140 characters” (Agravios Officiales in 140 caracteres), reviewed the personal accounts of important State officials during 29 months (January 1st, 2013 – May 30th, 2015) and found out that 699 targeted attacks against the press were made by 16 government figures during that period of time. And it even has a M. Night Shyamalan-styled twist: The greatest offender of all is CONATEL’s Director-General William Castillo (known in the Twitter-sphere as planwac). The same guy in charge of supervising the Internet in Venezuela and who recently asked for new legal reforms to regulate “criminal phenomenons” in the social networks. Castillo wrote at least 439 messages accusing non-hegemony media of causing “paranoia”, “anxiety” or being engaged in a “media war”. Far behind in second place is Castillo’s former boss and current Foreign Minister Delcy Rodriguez with 59 messages. Next in the ranking are VP Jorge Arreaza (24), Nicolas Maduro himself (23) and Carabobo State Governor Francisco Ameliach (20). In case you’re wondering, Diosdado Cabello came ninth with only 11 messages. He prefers to use state TV. We know that the communicational hegemony strongly believes in what can be described as an “alternative Twitter-verse”. And we also know that they’re using all the repressive tools at its disposal to enforce it. Now, we have a metric for this.